FALL IS UPON US. Sort of. It’s fall enough to have some butternut squash in my face, it’s fall enough for me to want to smash open a can of pumpkin every time I open the cupboard, and it’s fall enough for me to wear every sweater I own all at once and look for a beanie that actually fits my enormous alien head. Today was the first day in a while that it was actually cold. While I was on campus. With no sweatshirt. Of course. But it made me crave some butternut squash. It’s weird because I really can’t stand butternut squash unless it’s serving as a mean blanket for pasta and cheese. It’s the same with sweet potatoes except those are never allowed in my house. Sorry Oprah. It’s been a while since I’ve had the butternut squash pasta so I took another crack at it, this time adding one of my favorite things: chorizo. There’s just something about the spicy chorizo layered with the sweetness from the butternut squash that makes me want to make out with a bowl of pasta just a little bit more than usual. Let’s get our carb on. 12 oz chorizo, not the cured stuff. You want it to add to the sauce. First off, get a big pot of water going for the pasta and preheat the oven to 375. In a medium sized saucepan place squash, milk, and chicken stock. Bring to a simmer and cook for about 10 min, or until the squash is fork tender. Place in blender and let cool for a couple min. Toss your pasta in the water that should be boiling. Set a timer for a minute less than what the box says to cook it. Rinse out saucepan and add chorizo, cooking over medium heat until meat is cooked through and most of the fat has rendered, about 5 min. Blend the squash milk stock mixture until smooth, about 30 sec. Add to chorizo, stir in cheese. Tatse to see if it needs salt and pepper. This totally depends on your cheese, chicken stock, and chorizo. Drain pasta once the timer goes off, and add to a greased 9×13″ pan. Pour sauce over it and gently mix. Top with panko, then drizzle with olive oil. Add a sprinkle of cheese of your cheese loving heart desires. Bake for 20-30 min, until golden brown and ready for you to faceplant. Sweet, salty, spicy, fatty, carb-y?? Nailed it. You… are a genius. This looks incredible. And so simple! 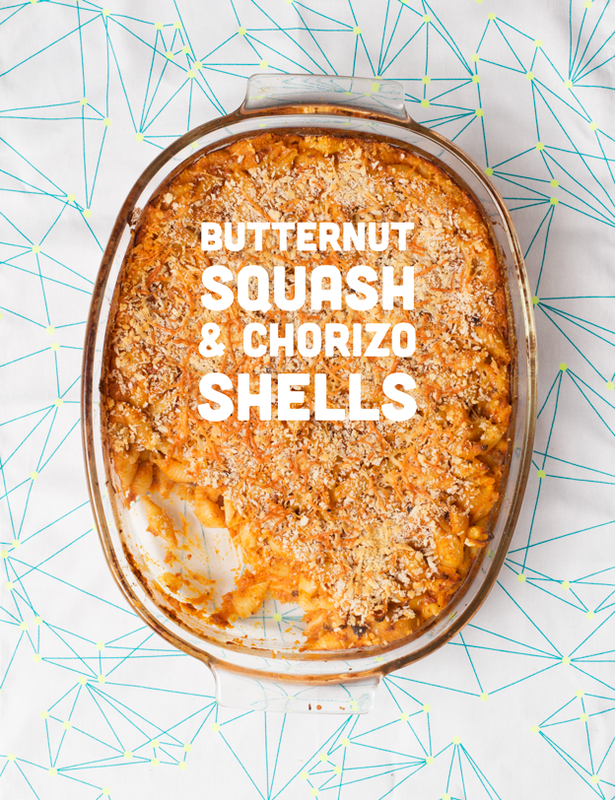 Chorizo and butternut squash sounds like a killer combo and with cheese too!! YES! You have an enormous alien head, TOO?!?!?! I mean, you want to smash open a can of pumpkin every time you open the cupboard, too? TWINSIES. Also I want to smash my face into this dish of carb heaven. P.S. I totally just bought that same towel from the Targets last week. TWINSIES. food/ towel twinsiez 4 life. It’s still hot as hell here in the A, so I don’t know nuthin about that sweater weather yet. But you can still t-shirt cannon me that entire casserole dish. okthanks. Very rarely do I read a recipe and then immediately go to the grocery store. But I am doing that presently. !!! Let me know how it turns out! You’re a chorizo master! I love this cool spin on the ol’ casserole! Chorizo is my secret weapon for anything. This is genius- totally my kinda dinner! I’ve missed you! Where you have been BILLAY? In San Francisco meeting up with Shutterbean or WHAT? Oh wait, you totally were. In any case, more posts more posts more posts! I TOTALLY WAS. Let’s see if I can be a posting machine. I totes made a stew with chorizo last week. It was the star of the stew. I mean, spicy sausage and cheese are bound to make any dish even better. 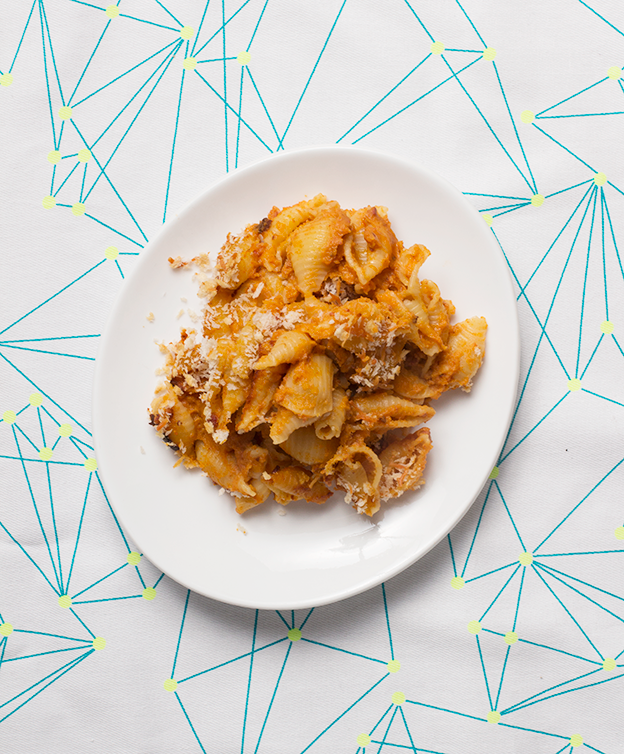 I need to get on this butternut squash pasta train – it sounds tasty! I wanna give this carb-wonder a hug. This would be like eating a hug. But the hug is a little spicy. BEST KIND OF HUG. ASDFGHJKLJCX BI SCIHWSCB YOU JUST BLEW MY BRAIN. This looks like the most delicious thing created on the planet!!!! made it. added extra chorizo, just ‘cus. loved it. will make it again. This is the dish that will make my husband run to the jewelry store. Reality in our case, Amazon for a new camera lens or a new mac. But, can I just say I had to click over as soon as I saw the words Chorizo. Pinning and making. I just made this recipe.OH MY GOSH!!! It was amazing! Will definitely make it again! Thanks! Thank you for bringing chorizo to shell beach – making this! Just made thus for dinner with spicy shredded chicken. It was really great and really easy. Thanks for a great recipe! Ahhhhhhh!!!! So amazing!!!! My husband, and two year old son,and I all loooooved this!!!!! I even put siracha on mine (figured two birds, one stone since I had also seen your link to siracha mac and cheese). This is going straight in my menu rotation. Seriously, the boys can’t get enough!!!! It’s a win! Just made this! And I’m FREAKING OUT. Soooooooo good! How do I know if my chorizo is cured or not? The kind I bought is in long skinny tubes. Hey Christina! The cured kind is usually more firm, while the uncured chorizo has more of a raw squishy consistency. Most brands also say on the package somewhere. Great dish – really yummy! I used andouille sausage, sautéed w/onion and added parmesan cheese s & p to the bread crumbs along with a few TBS of EVOO – made the topping really tasty.